For other uses, see Compressor (disambiguation). Reciprocating compressors use pistons driven by a crankshaft. They can be either stationary or portable, can be single or multi-staged, and can be driven by electric motors or internal combustion engines. Small reciprocating compressors from 5 to 30 horsepower (hp) are commonly seen in automotive applications and are typically for intermittent duty. Larger reciprocating compressors well over 1,000 hp (750 kW) are commonly found in large industrial and petroleum applications. Discharge pressures can range from low pressure to very high pressure (>18000 psi or 180 MPa). In certain applications, such as air compression, multi-stage double-acting compressors are said to be the most efficient compressors available, and are typically larger, and more costly than comparable rotary units. Another type of reciprocating compressor, usually employed in automotive cabin air conditioning systems, is the swash plate or wobble plate compressor, which uses pistons moved by a swash plate mounted on a shaft (see axial piston pump). Household, home workshop, and smaller job site compressors are typically reciprocating compressors 1½ hp or less with an attached receiver tank. A linear compressor is a reciprocating compressor with the piston being the rotor of a linear motor. An ionic liquid piston compressor, ionic compressor or ionic liquid piston pump is a hydrogen compressor based on an ionic liquid piston instead of a metal piston as in a piston-metal diaphragm compressor. Rotary screw compressors use two meshed rotating positive-displacement helical screws to force the gas into a smaller space. These are usually used for continuous operation in commercial and industrial applications and may be either stationary or portable. Their application can be from 3 horsepower (2.2 kW) to over 1,200 horsepower (890 kW) and from low pressure to moderately high pressure (>1,200 psi or 8.3 MPa). The classifications of rotary screw compressors vary based on stages, cooling methods, and drive types among others. Rotary screw compressors are commercially produced in Oil Flooded, Water Flooded and Dry type. The efficiency of rotary compressors depends on the air drier,[clarification needed] and the selection of air drier is always 1.5 times volumetric delivery of the compressor. Designs with a single screw  or three screws  instead of two exist. Rotary vane compressors consist of a rotor with a number of blades inserted in radial slots in the rotor. The rotor is mounted offset in a larger housing that is either circular or a more complex shape. As the rotor turns, blades slide in and out of the slots keeping contact with the outer wall of the housing. Thus, a series of increasing and decreasing volumes is created by the rotating blades. 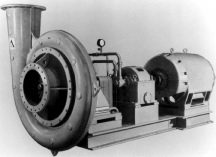 Rotary Vane compressors are, with piston compressors one of the oldest of compressor technologies. With suitable port connections, the devices may be either a compressor or a vacuum pump. They can be either stationary or portable, can be single or multi-staged, and can be driven by electric motors or internal combustion engines. Dry vane machines are used at relatively low pressures (e.g., 2 bar or 200 kPa or 29 psi) for bulk material movement while oil-injected machines have the necessary volumetric efficiency to achieve pressures up to about 13 bar (1,300 kPa; 190 psi) in a single stage. A rotary vane compressor is well suited to electric motor drive and is significantly quieter in operation than the equivalent piston compressor. Rotary vane compressors can have mechanical efficiencies of about 90%. The Rolling piston in a rolling piston style compressor plays the part of a partition between the vane and the rotor. Rolling piston forces gas against a stationary vane. 2 of these compressors can be mounted on the same shaft to increase capacity and reduce vibration and noise. A design without a spring is known as a swing compressor. In refrigeration and air conditioning, this type of compressor is also known as a rotary compressor, with rotary screw compressors being also known simply as screw compressors. A scroll compressor, also known as scroll pump and scroll vacuum pump, uses two interleaved spiral-like vanes to pump or compress fluids such as liquids and gases. The vane geometry may be involute, archimedean spiral, or hybrid curves. They operate more smoothly, quietly, and reliably than other types of compressors in the lower volume range. Due to minimum clearance volume between the fixed scroll and the orbiting scroll, these compressors have a very high volumetric efficiency. These compressors are extensively used in air conditioning and refrigeration because they are lighter, smaller and have fewer moving parts than reciprocating compressors and they are also more reliable. They are more expensive though, so peltier coolers or rotary and reciprocating compressors may be used in applications where cost is the most important or one of the most important factors to consider when designing a refrigeration or air conditioining system. This type of compressor was used as the supercharger on Volkswagen G60 and G40 engines in the early 1990s. A diaphragm compressor (also known as a membrane compressor) is a variant of the conventional reciprocating compressor. The compression of gas occurs by the movement of a flexible membrane, instead of an intake element. The back and forth movement of the membrane is driven by a rod and a crankshaft mechanism. Only the membrane and the compressor box come in contact with the gas being compressed. The degree of flexing and the material constituting the diaphragm affects the maintenance life of the equipment. Generally stiff metal diaphragms may only displace a few cubic centimeters of volume because the metal can not endure large degrees of flexing without cracking, but the stiffness of a metal diaphragm allows it to pump at high pressures. Rubber or silicone diaphragms are capable of enduring deep pumping strokes of very high flexion, but their low strength limits their use to low-pressure applications, and they need to be replaced as plastic embrittlement occurs. The photograph on the right depicts a three-stage diaphragm compressor used to compress hydrogen gas to 6,000 psi (41 MPa) for use in a prototype compressed hydrogen and compressed natural gas (CNG) fueling station built in downtown Phoenix, Arizona by the Arizona Public Service company (an electric utilities company). Reciprocating compressors were used to compress the natural gas. The reciprocating natural gas compressor was developed by Sertco. Dynamic compressors depend upon the inertia and momentum of a fluid. Also known as a trompe. A mixture of air and water generated through turbulence is allowed to fall into a subterranean chamber where the air separates from the water. The weight of falling water compresses the air in the top of the chamber. A submerged outlet from the chamber allows water to flow to the surface at a lower height than the intake. An outlet in the roof of the chamber supplies the compressed air to the surface. A facility on this principle was built on the Montreal River at Ragged Shutes near Cobalt, Ontario in 1910 and supplied 5,000 horsepower to nearby mines. Centrifugal compressors use a rotating disk or impeller in a shaped housing to force the gas to the rim of the impeller, increasing the velocity of the gas. A diffuser (divergent duct) section converts the velocity energy to pressure energy. They are primarily used for continuous, stationary service in industries such as oil refineries, chemical and petrochemical plants and natural gas processing plants. Their application can be from 100 horsepower (75 kW) to thousands of horsepower. With multiple staging, they can achieve high output pressures greater than 1,000 psi (6.9 MPa). This type of compressor, along with screw compressors, are extensively used in large refrigeration and air conditioning systems. Magnetically levitated and air bearing centrifugal compressors exist. Many large snowmaking operations (like ski resorts) use this type of compressor. They are also used in internal combustion engines as superchargers and turbochargers. Centrifugal compressors are used in small gas turbine engines or as the final compression stage of medium-sized gas turbines. Diagonal or mixed-flow compressors are similar to centrifugal compressors, but have a radial and axial velocity component at the exit from the rotor. The diffuser is often used to turn diagonal flow to an axial rather than radial direction. Comparative to the conventional centrifugal compressor (of the same stage pressure ratio), the value of the speed of the mixed flow compressor is 1.5 times larger. Axial-flow compressors are dynamic rotating compressors that use arrays of fan-like airfoils to progressively compress a fluid. They are used where high flow rates or a compact design are required. The arrays of airfoils are set in rows, usually as pairs: one rotating and one stationary. The rotating airfoils, also known as blades or rotors, accelerate the fluid. The stationary airfoils, also known as stators or vanes, decelerate and redirect the flow direction of the fluid, preparing it for the rotor blades of the next stage. Axial compressors are almost always multi-staged, with the cross-sectional area of the gas passage diminishing along the compressor to maintain an optimum axial Mach number. Beyond about 5 stages or a 4:1 design pressure ratio a compressor will not function unless fitted with features such as stationary vanes with variable angles (known as variable inlet guide vanes and variable stators), the ability to allow some air to escape part-way along the compressor (known as interstage bleed) and being split into more than one rotating assembly (known as twin spools, for example). Axial compressors can have high efficiencies; around 90% polytropic at their design conditions. However, they are relatively expensive, requiring a large number of components, tight tolerances and high quality materials. Axial-flow compressors are used in medium to large gas turbine engines, natural gas pumping stations, and some chemical plants. A small hermetically sealed compressor in a common consumer refrigerator or freezer typically has a rounded steel outer shell permanently welded shut, which seals operating gases inside the system. There is no route for gases to leak, such as around motor shaft seals. On this model, the plastic top section is part of an auto-defrost system that uses motor heat to evaporate the water. Compressors used in refrigeration systems are often described as being either hermetic, open, or semi-hermetic, to describe how the compressor and motor drive are situated in relation to the gas or vapor being compressed. The industry name for a hermetic is hermetically sealed compressor, while a semi-hermetic is commonly called a semi-hermetic compressor. The difference between the hermetic and semi-hermetic, is that the hermetic uses a one-piece welded steel casing that cannot be opened for repair; if the hermetic fails it is simply replaced with an entire new unit. A semi-hermetic uses a large cast metal shell with gasketed covers with screws that can be opened to replace motor and compressor components. The primary advantage of a hermetic and semi-hermetic is that there is no route for the gas to leak out of the system. Open compressors rely on shaft seals to retain the internal pressure, and these seals require a lubricant such as oil to retain their sealing properties. An open pressurized system such as an automobile air conditioner can be more susceptible to leak its operating gases. Open systems rely on lubricant in the system to splash on pump components and seals. If it is not operated frequently enough, the lubricant on the seals slowly evaporates, and then the seals begin to leak until the system is no longer functional and must be recharged. By comparison, a hermetic or semi-hermetic system can sit unused for years, and can usually be started up again at any time without requiring maintenance or experiencing any loss of system pressure. The disadvantage of hermetic compressors is that the motor drive cannot be repaired or maintained, and the entire compressor must be replaced if a motor fails. A further disadvantage is that burnt-out windings can contaminate whole systems, thereby requiring the system to be entirely pumped down and the gas replaced (This can also happen in semi hermetic compressors where the motor operates in the refrigerant). Typically, hermetic compressors are used in low-cost factory-assembled consumer goods where the cost of repair and labor is high compared to the value of the device, and it would be more economical to just purchase a new device or compressor. Semi-hermetic compressors are used in mid-sized to large refrigeration and air conditioning systems, where it is cheaper to repair the compressor rather than buying and installing a new one. A hermetic compressor is simpler and cheaper to build than a semi-hermetic compressor. An advantage of open compressors is that they can be driven by non-electric power sources, such as an internal combustion engine or turbine. However, open compressors that drive refrigeration systems are generally not totally maintenance-free throughout the life of the system, since some gas leakage will occur over time. Therefore, work-consuming devices such as pumps and compressors (work is negative) require less work when they operate reversibly. P-v (Specific volume vs. Pressure) diagram comparing isentropic, polytropic, and isothermal processes between the same pressure limits.
) work in decreases as the exponent, n, decreases, by increasing the heat rejection during the compression process. One common way of cooling the gas during compression is to use cooling jackets around the casing of the compressor. NOTE: The isentropic assumptions are only applicable with ideal cycles. Real world cycles have inherent losses due to inefficient compressors and turbines. The real world system are not truly isentropic but are rather idealized as isentropic for calculation purposes. Compression of a gas increases its temperature. in which p is pressure, V is volume, n takes different values for different compression processes (see below), and 1 & 2 refer to initial and final states. (the ratio of specific heats). Isothermal - This model assumes that the compressed gas remains at a constant temperature throughout the compression or expansion process. In this cycle, internal energy is removed from the system as heat at the same rate that it is added by the mechanical work of compression. Isothermal compression or expansion more closely models real life when the compressor has a large heat exchanging surface, a small gas volume, or a long time scale (i.e., a small power level). Compressors that utilize inter-stage cooling between compression stages come closest to achieving perfect isothermal compression. However, with practical devices perfect isothermal compression is not attainable. For example, unless you have an infinite number of compression stages with corresponding intercoolers, you will never achieve perfect isothermal compression. When evaluated, the isothermal work is found to be lower than the adiabatic work. In the case of centrifugal compressors, commercial designs currently do not exceed a compression ratio of more than 3.5 to 1 in any one stage (for a typical gas). Since compression raises the temperature, the compressed gas is to be cooled between stages making the compression less adiabatic and more isothermal. The inter-stage coolers typically result in some partial condensation that is removed in vapor-liquid separators. In the case of small reciprocating compressors, the compressor flywheel may drive a cooling fan that directs ambient air across the intercooler of a two or more stage compressor. Steam turbines or water turbines are possible for large compressors. Electric motors are cheap and quiet for static compressors. Small motors suitable for domestic electrical supplies use single-phase alternating current. Larger motors can only be used where an industrial electrical three phase alternating current supply is available. Diesel engines or petrol engines are suitable for portable compressors and support compressors. In automobiles and other types of vehicles (including piston-powered airplanes, boats, trucks, etc. ), diesel or gasoline engines power output can be increased by compressing the intake air, so that more fuel can be burned per cycle. These engines can power compressors using their own crankshaft power (this setup known as a supercharger), or, use their exhaust gas to drive a turbine connected to the compressor (this setup known as a turbocharger). In pipeline transport of purified natural gas from the production site to the consumer, a compressor is driven by a gas turbine fueled by gas bled from the pipeline. Thus, no external power source is necessary. Petroleum refineries, natural gas processing plants, petrochemical and chemical plants, and similar large industrial plants require compressing for intermediate and end-product gases. Refrigeration and air conditioner equipment use compressors to move heat in refrigerant cycles (see vapor-compression refrigeration). Gas turbine systems compress the intake combustion air. Small-volume purified or manufactured gases require compression to fill high pressure cylinders for medical, welding, and other uses. Various industrial, manufacturing, and building processes require compressed air to power pneumatic tools. In the manufacturing and blow moulding of PET plastic bottles and containers. Some aircraft require compressors to maintain cabin pressurization at altitude. Some types of jet engines—such as turbojets and turbofans—compress the air required for fuel combustion. The jet engine's turbines power the combustion air compressor. In SCUBA diving, hyperbaric oxygen therapy, and other life support devices, compressors put breathing gas into small volume containers, such as diving cylinders. In surface supplied diving, an air compressor frequently supplies low pressure air (10 to 20 bar) for breathing. Submarines use compressors to store air for later use in displacing water from buoyancy chambers to adjust depth. Turbochargers and superchargers are compressors that increase internal combustion engine performance by increasing the mass flow of air inside the cylinder, so the engine can burn more fuel and hence produce more power. Rail and heavy road transport vehicles use compressed air to operate rail vehicle or road vehicle brakes—and various other systems (doors, windscreen wipers, engine, gearbox control, etc.). Service stations and auto repair shops use compressed air to fill pneumatic tires and power pneumatic tools. Fire pistons and heat pumps exist to heat air or other gasses, and compressing the gas is only a means to that end. Rotary lobe compressors are often used to provide air in pneumatic conveying lines for powder or solids. Pressure reached can range from 0.5 to 2 bar g.
^ Screw Compressor Archived 2008-01-10 at the Wayback Machine Describes how screw compressors work and include photographs. ^ ICS. "How Does a Rotary Screw Air Compressor Work?". Archived from the original on 2017-08-17. Retrieved 2017-08-16. ^ Cheremisinoff, Nicholas P.; Davletshin, Anton (2015-01-28). Hydraulic Fracturing Operations: Handbook of Environmental Management Practices. John Wiley & Sons. ISBN 9781119100003. Archived from the original on 2017-12-24. ^ "Motion of Rolling Piston in Rotary Compressor". Purdue University. Archived from the original on 2017-08-16. Retrieved 2017-08-16. ^ Tischer, J., Utter, R: “Scroll Machine Using Discharge Pressure For Axial Sealing,” U.S. Patent 4522575, 1985. ^ Caillat, J., Weatherston, R., Bush, J: “Scroll-Type Machine With Axially Compliant Mounting,” U.S. Patent 4767293, 1988. ^ Richardson, Jr., Hubert: “Scroll Compressor With Orbiting Scroll Member Biased By Oil Pressure,” U.S. Patent 4875838, 1989. ^ Eric Slack (Winter 2016). "Sertco". Energy and Mining International. Phoenix Media Corporation. Archived from the original on March 4, 2016. Retrieved February 27, 2016. ^ Maynard, Frank (November 1910). "Five thousand horsepower from air bubbles". Popular Mechanics: Page 633. Archived from the original on 2017-03-26. ^ Dixon S.L. (1978). Fluid Mechanics, Thermodynamics of Turbomachinery (Third ed.). Pergamon Press. ISBN 0-08-022722-8. ^ Aungier, Ronald H. (2000). Centrifugal Compressors A Strategy for Aerodynamic design and Analysis. ASME Press. ISBN 0-7918-0093-8. ^ Cheremisinoff, Nicholas P. (2016-04-20). Pollution Control Handbook for Oil and Gas Engineering. John Wiley & Sons. ISBN 9781119117889. Archived from the original on 2017-12-24. ^ Kano, Fumikata. "Development of High Specific Speed Mixed Flow Compressors" (PDF). Texas A&M University. Archived from the original (PDF) on 2014-08-11. Retrieved 2017-08-16. ^ a b c Cengel, Yunus A., and Michaeul A. Boles. Thermodynamics: An Engineering Approach. 7th Edition ed. New York: Mcgraw-Hill, 2012. Print. ^ PTC 10 Compressors and Exhausters Archived 2015-06-19 at the Wayback Machine. ^ Millar IL, Mouldey PG (2008). "Compressed breathing air – the potential for evil from within". Diving and Hyperbaric Medicine. South Pacific Underwater Medicine Society. 38 (2): 145–51. PMID 22692708. Archived from the original on 2010-12-25. Retrieved 2009-02-28. ^ Harlow, V (2002). Oxygen Hacker's Companion. Airspeed Press. ISBN 0-9678873-2-1. ^ Staff. "Blowers (Roots)". Engineering resources for powder processing industries. www.powderprocess.net. Archived from the original on 14 August 2017. Retrieved 15 August 2017.